This research is focused on the rational approach to design and synthesis of a novel series of triazole linked pyrrole derivatives through a sequential Paal–Knorr reaction and Click chemistry. 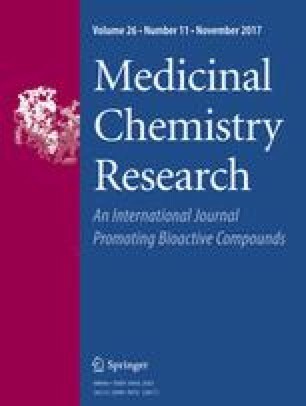 These new molecules were screened against Mycobacterium tuberculosis H37Rv and found to display promising anti-mycobacterial activity. Among various compounds, 7g and 7l were identified as leads with minimum inhibitory concentration value 0.78 (μg/mL), which are more effective than standard drugs such as pyrazinamide, ethambutol, and ciprofloxacin and less active than isoniazid and rifampicin. These molecules (minimum inhibitory concentration values <12.5 μg/mL) were also screened against HEK-293T cancer cell lines. Most of these molecules are less toxic but possess higher selectivity index, which indicates the suitability of these compounds for further evaluation. The online version of this article (doi: 10.1007/s00044-017-1997-4) contains supplementary material, which is available to authorized users. Authors are thankful to Dr. Lakshmi Kantham, Director and Dr. V. Jayathirtha Rao, Head, Crop Protection Chemicals Division, CSIR-IICT, Hyderabad, INDIA for their continuous encouragement, support and also P.L.R. thankful to UGC, New Delhi, India for the financial support in the form of fellowships.